In this paper, a multi-grid algorithm is applied to a large-scale block matrix that is produced from a Beam and Warming scheme. The Beam and Warming scheme is used in the simulation of unsteady flow in an open channel. The Gauss-Seidel block-wise iteration method is used for a smoothing process with a few iterations. It is also shown that the governing equations determine the type of prolongation and restriction operators for the multi-grid algorithm. Unsteady flow is of great interest to hydraulic engineers. Such flows can be described by the Saint-Venant equations which consist of equations for conservation of mass and momentum. The Saint-Venant equations are also non-linear hyperbolic partial differential equations. However, a general closed-form solution of these equations is not available, except for certain special simplified conditions, and they must be solved using an appropriate numerical technique. Among different numerical methods, the implicit finite-difference method and finite element method have been widely used for the solution of 1-dimensional unsteady open-channel flow problems (Aureli et al., 2008; Catellal, 2008; Choi and Molinas, 1993; Jha et al., 1994; Nguyen and Kawano, 1995; Sen and Garg, 2002; Tseng and Chu, 2000; Venutelli, 2002). 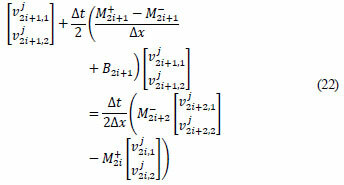 The discretisation of partial differential equations leads to very large systems of equations. For 2-dimensional problems, several 10 thousands of unknowns are not usual, and in 3 spatial dimensions more than 1 million unknowns can be reached very easily. Therefore, iterative methods like Jacobi or Gauss- Seidel relaxations have been used. Nevertheless, the main defect of iterative methods is that these will work very well in a few iterations, but after that these methods will be converged slowly. Multi-grid algorithms will solve this problem (Bramble and Pasciak, 1987; Tavakoli and Kerayechian, 2007; Tavakoli, 2010). Multi-grid methods are the fastest known methods for the solution of the large systems of equations arising from the discretisation of partial differential equations (for more details see Bramble, 1993). z the side slope of the channel. is the Jacobian matrix and D = A/W (η) is the hydraulic depth. c is the wave celerity expressed as , and the λi values are eigen-values of M giving the characteristic directions. M and B are the Jacobians of F and S with respect to U, respectively. I = α (2 x 2) unit matrix. 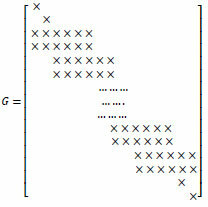 Multi-grid algorithms have become a common approach for solving many types of linear problems of the form Gx = b. In order to describe the multi-grid algorithm, let Ω be the domain of problem (1). To approximate , we consider a sequence of subintervals Ωj of Ω determined by a regular subdivision; namely, the set Ω is divided into 2j equi-distant subintervals at levelj = 1,2, ..., J. In addition, we denote Gj as the generated matrix by Beam-Warming scheme at the level j and at the finest level j=J we define GJ = G. Moreover, we consider as an operator from the coarse grid Ωj-1 to the fine grid Ωj. Furthermore, we define Rj as a smoothing operator for level j . For example, in the Jacobi relaxation scheme, Rj is defined D-1 where Dj is the diagonal matrix of G. We denote an approximation of the exact solution x by v and the error, e = x - v by e. Defining the residual by r = b - Gv, we observe the critical relationship known as the residual equation, namely Ge = r. In brief, there is a recursive application of the 2-grid process. First, an iterative method such as the Jacobi or Richardson relaxation is applied to the fine-grid problem. These iterations have the property that after relaxation the error will be smooth. This in turn means that the error can be accurately represented on a coarse grid. 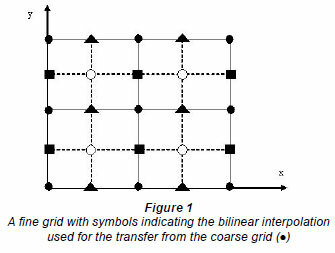 Since the coarse grid is much smaller than the fine grid, it is much less expensive to work on the coarse grid. These facts permit the second part of the process, known as the coarse-grid correction. The fine-grid residual rj at the level j is computed and restricted to the coarse grid rj-1 = rj at the level j-1, where it is used as the righthand side of the coarse-grid residual equation Gj-1ej-1 = rj-1. This equation is solved and the error thus determined is then interpolated back to the fine grid, where it is used to correct the fine-grid approximation, vj ← vj+ Ij-1ej-1. By recursively solving the coarse-grid equation with this 2-grid process, a multi-grid algorithm is defined. Now we are ready to state the multi-grid algorithm (Bramble and Pasciak, 1987; Bramble et al., 1991). We note that b0 is determined recursively by Step (2) in the following error correction step. For j > 1, MG(xº, bj) is obtained recursively in 7 steps. xl = x1-l + Rj (bj - Gjx 1-1). 3. Set qº = 0. 6. Define x1 for l = m +1,...,2m by xl+1 = x1 + Rj (bj - Gjx l). 7. Define MG (J, xº, b) = x2m. In this algorithm, m is a positive integer which may vary from level to level and determines the number of pre- and postsmoothing iterations. If p = 1, we have a V-cycle multi-grid algorithm. If p = 2 , we have a W-cycle algorithm. A variable V-cycle algorithm is one in which the number of smoothing m increases exponentially as j decreases (i.e., p = 1 and m = 2J-j). The above multi-grid is called a symmetric multi-grid algorithm. If the post-smoothing step is removed, it is called a non-symmetric multi-grid algorithm. In addition, the restriction operator, = 2 ( )T is used. Remark: It is clear that the number of required arithmetic operations to construct this operator is more expensive than the standard operator. However, this is not so important because, the inter-grid transfer operators are only constructed once. The expense of running some systems by the multi-grid Beam-Warming scheme involving this new inter-grid transfer operator is much lower than for the ones involving standard operators. Also, constructing a non-standard mapping on (○) can be done in a way similar to Eq. (23). Di, i = 1,2,..., n and Ei, Fi i = 2,3,..., n are 2x2 matrices. 2. Define x1 for l = m 1,...,m by x(l+1) = xl-1 + (D-E) -1 (b - G1x (l-1)). 3. Set r1 = b G1x m). 8. Define X(l) for l = m 1,...,2m by x(l+1) = x(l) + (D-E) -1 (b - G1x (l)). In the above algorithm, as already mentioned, G0 and G1 denote the system produced by the Beam-Warming scheme in the coarse and fine grids, respectively. We recall that other relaxation schemes such as incomplete LU factorisation can be applied here. In order to evaluate the accuracy of the block multi-grid algo rithm for the Beam-Warming scheme, we first solved a classic open-channel shock wave propagation problem. The numerical properties were analysed and illustrated by 2 different examples. Both examples were solved by Matlab 7.5. Since in the high levels (level 3 upwards), matrix G (which it is obtained by the Beam and Warming scheme) cannot be stored in the computer, we stored matrix G by some block matrices whose numbers depend on the level they are in. Therefore, there is no explicit matrix G and there are merely a number of block matrices, the combinations of which would create matrix G.
In both examples, the V-cycle algorithm is used, in which the number of iterations in pre- and post-smoothing processes has been taken as m = 2 for each level j. The hydraulic events following the sudden closure of a gate in a channel are important for designing power channels. For example, the gates of a power channel may be closed instantaneously, which causes an increase in the flow depth. In these situations, the knowledge of the height of the resulting surge is essential for designing a channel. 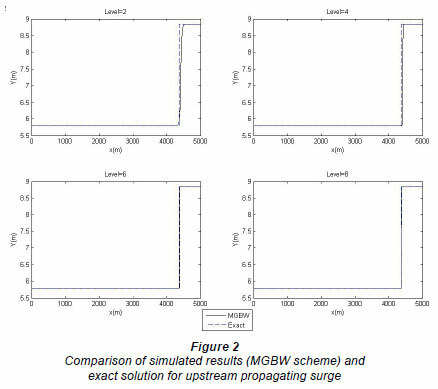 In this example, the performance of the multigrid Beam and Warming (MGBW) scheme for surge propagation due to sudden closure of a gate is examined in comparison with the exact solution. We considered a channel with a rectangular crosssection, the bottom of which is 6.1 m wide. The initial conditions in the channel are: 5.79 m deep with a steady discharge of 126 m3·s-1. The channel is horizontal and frictionless with a length of 5 km. The water surface level in the reservoir is constant at the upstream end and the sluice gate at the downstream end of the channel is suddenly closed at time t = 0. Figure 2 shows the simulated results by the MGBW scheme with the exact solution (Featherstone and Nalluri, 1995) just 90 s after gate closure for different levels. The finest level is considered J=8, and also at the coarsest level, the grid size in space Δx and in time Δt are taken as 25 m and 2.2514 s, respectively. Hence, the system produced by the Beam-Warming scheme at the coarsest level (J=1) has 202 x 202, and at the finest level (J=8) 25 602 x 25 602 dimensions at any time level. It can be seen that the MGBW scheme is in a good agreement with the exact solution. Figure 3 shows the simulated results by the finite-difference Beam and Warming (FDBW) scheme (Chaudhry, 1993) with the exact solution. In this figure, we considered (a) Δx = 25 and Δt = 2.2514, (b) Δx = 12.5 and Δt = 1.1257, (c) Δx = 6.25 and Δt = 0.5629, (d) Δx = 3.125 and Δt = 0.2814. Figures 3a, 3b, 3c and 3d correspond to levels 1, 2, 3 and 4 of MGBW scheme, respectively. In this example, the simulated results are satisfactory and hence this scheme is valid. Let and be the approximated solution obtained by MGBW and exact solution, respectively. Table 1 shows the Euclidean error norm for different times from level j=3 to j=8. As we can see, when the level increases, the value of error decreases significantly. In addition, we examined this example without the multi-grid scheme. 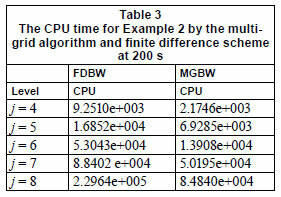 The CPU time concerning the perfor mance in Example 1 by the MGBW and FDBW schemes at 200 s is given in Table 2. The stop criterion for FDBW is . In Table 2, MGBW and SMG denote the Beam-Warming and standard inter-grid transfer operators applied to the Gauss-Seidel algorithm, respectively. The standard inter-grid transfer operator that we used is the injection operator. As we observe, the CPU time decreases significantly from level 4 to the end when we use multi grid scheme. 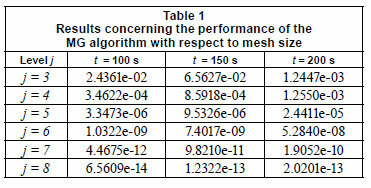 Moreover, in the second and third columns we see that the MGBW algorithm is run faster than the SMG algorithm. Table 2 shows the efficiency of the multi-grid algorithm, clearly. Because flood waves normally have a rising limb, a falling limb and a single peak similar to a triangular hydrograph, the latter is usually used as an input function for flood routing analysis. This example is presented for a case of subcritical flow in a rectangular channel with the length of L = 20 km, width of 6 m, uniform bottom slope of S0 = 0.00193 and a roughness defined by the Manning nc = 0.025 m-1/3 s. Also, uniform flow with a depth of 0.5 m and velocity corresponding to Froude number Fr = 0.5 are considered for the initial conditions. The upstream boundary conditions are defined by a triangular hydrograph Q = Q(t) which changes linearly from 3 to 21.57 m3·s-1 in 600 s and then decreases to 3 m3·s-1, again in 600 s. The downstream boundary conditions are: h = h(t) = const. In Fig. 4, Q = Q(t) for the sections x = 1 000 and 2 000 m at the level j=3 with Δx = 10 m and Δt = 3 s, is given by the MGBW and FDBW schemes. Hence, the system resulting from the Beam-Warming scheme at the coarsest level (J=1) has 1002 x 1002, and at the finest level (J=8), 128002 x 128002 dimensions at any time level. The CPU time for Example 2 by the MGBW and FDBW schemes at 200 s is given in Table 3. We considered n=500 iterations for the FDBW scheme in any time. table 3 shows that the MGBW scheme is run faster than the FDBW scheme. 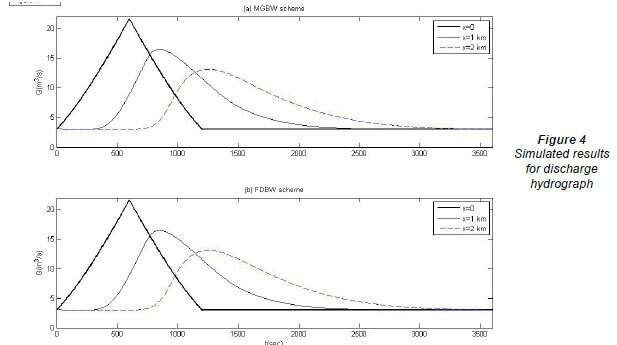 This paper presents a numerical analysis of the MGBW scheme applied to the complete Saint-Venant equations written for 1-dimensional unsteady flow. Solving the Saint-Venant problem by the Beam and Warming scheme concludes a linear system Gx = b. In order to find a good solution, we need to use a very small size for the grid in terms of space (Δx) and time (Δt). Then, the dimension of G would be very large and saving this matrix in a computer is impossible. Hence, most of the iterative methods cannot be used. MGBW has been used to solve the problem. The main factor that influences the convergence rate of the multi-grid continuation algorithms is the distance between the solutions provided by different meshes. MGBW significantly reduces the computational time. 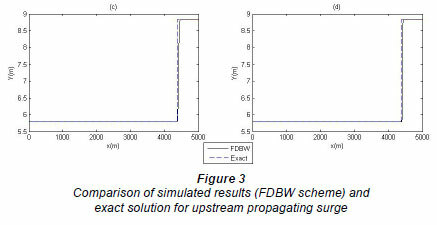 The MGBW scheme may be expected to give accurate results for other unsteady open-channel flow problems, such as those involving propagation of a flood wave in a natural stream or flow in a transition. The authors would like to thank the anonymous referees for their valuable comments and suggestions. Also, the second author gratefully acknowledges the financial support by the Vali-e-Asr University of Rafsanjan, Iran (Grant No. p/1453). BRAMBLE J and PASCIAK J (1987) New convergence estimates for multigrid algorithms. Math. Comput. 49 311-329. Received 8 March 2010; accepted in revised form 7 March 2011.